Games and gaming principles have a useful role in exhibit design for both real world and virtual settings. “As educators, we’re always looking for ways to make museum content ‘stickier’ and more meaningful,” says Michelle Moon in a recent blog post, “All fun and games.” Moon designs and runs public programs for adults at the Peabody Essex Museum. Roleplaying Games: Create powerful empathetic experiences, and give insight into what happens when different points of view collide. Roleplaying games can range from simple to fearsomely complex when variables of character qualities, goals, obstacles, and novel situations are factored in. Action Games: Get visitors moving. In outdoor spaces or large indoor halls, visitors can running through boundary areas, collect items, and navigate obstacles. Instructors create a physical space with very simple materials, like poker chips, lengths of rope, and paper plates, and use students’ powers of imagination to redefine them as resources like food or water, and constraints like space or predatation. Tabletop Games: Board games, card games, dice games, tile games, and even paper-and-pencil games can create a context for history learning. Building on existing game types, content and imagery can be adapted to local content and topics. Parlor Games/Social Games: Some games require only people. Both period games like Victorian parlor games, and games that use words, motions, questions and answers (like 20 Questions). 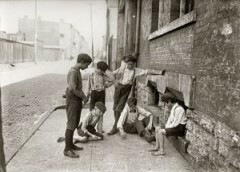 Street play games, like handclapping games, hopscotch, foursquare, or running bases, are also social and simple to present. Period Games: Bring a historical moment to life, giving a view of material culture and leisure time activities. At Strawbery Banke, red baskets contain popular toys and games from a historical time — a set of marbles in the 1950s Shapley-Drisco House, a Shut the Box board in the Colonial tavern. See also “Gaming the Past,” a repository for theory, research, and implementations of simulation games for history education.